Have you heard about this awesome offer? If you've ever thought about signing up to be a Thirty-One consultant but weren't sure about the $99 initial investment now's the time to check it out. I was a consultant awhile back, but when I moved to an at home job I lost contact with a lot of people and just couldn't seem to keep my client base up and do what I need at home. So I decided to just be a customer until my kiddos weren't so dependent on me and I had the time to devote to it again. 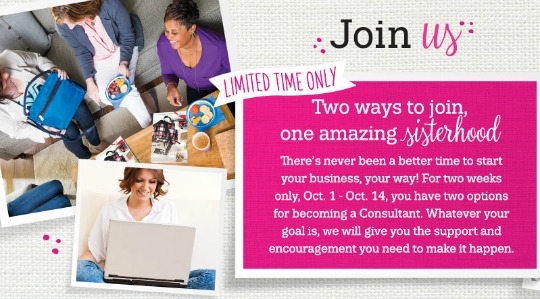 From now through October 14, potential sales consultants may now choose between the $1 enrollment or the traditional $99 enrollment in the U.S., which includes a starter kit of products and marketing materials for new consultants. The new $1 enrollment does not include the starter kit, but does include a personal Thirty-One website with a monthly fee of $14.95. It also includes access to online versions of learning and business materials, plus access to marketing materials. Consultants enrolling in the new program will sell products via online parties. As new consultants earn products through sales incentives, they may expand their businesses with home parties and catalog parties – where a hostess shares the Thirty-One catalog and collects orders for a period of time. Through direct selling, sales consultants run their own businesses, working as much or as little as they want. Many women join in order to supplement their own or a spouse’s income, or to earn money for something special. To learn more, visit the Thirty-One Gifts website and click on Join Us at the top.